There’s nothing like enjoying Strawberry Scones from scratch for breakfast with a hot cup of tea and someone you love. Fresh strawberries sugared to perfection really make this recipe the best! I loooove scones, don’t you? For me, there’s nothing better when paired with a nice hot cup of tea. Scones and hot tea are like a match made in heaven. Have you ever had a real “tea time” experience with your children or a close group of friends? There’s nothing like it! That’s where I was first introduced and I fell in absolute LOVE! Immediately came home with a ready-to-bake can of scones dough, baked it up, and realized how it wasn’t the same. There truly is nothing like a fresh made scones from scratch, like this Strawberry Scones recipe. If you’ve never had the pleasure of making scones from scratch before, do not despair! They are not hard AT ALL to make! If you can make homemade cookies from scratch, you can DEFINITELY handle making these Strawberry Scones from scratch. (Head’s up, by the way, I’ll be preparing more from-scratch scones recipes in the coming weeks!) Heck, because this is such an easy scones recipe to make, it’s easy to double or triple! When making this recipe, plan in advance to sugar (or “macerate”) the strawberries to get them perfectly juicy. You can do this overnight, even! Strawberries are often macerated simply by sprinkling them with sugar, because doing so draws the liquid out of the berries, creating a syrup. This syrup is then added with the sliced strawberries to the scone batter, and it tastes amazing! Sugaring strawberries has been a favorite in our household, and it makes all the difference in this delicious scones recipe! By giving yourself time to sugar the strawberries in advance, you’ll get them optimally juicy, making this recipe even more incredible! It doesn’t have to be complicated to be beautiful or taste magnificent, and this recipe proves it! Uncomplicated, using minimal ingredients, nothing over the top, and the results are amazing! These Strawberry Scones will be a favorite for many years to come! I’m all about the easy recipes here on this site. 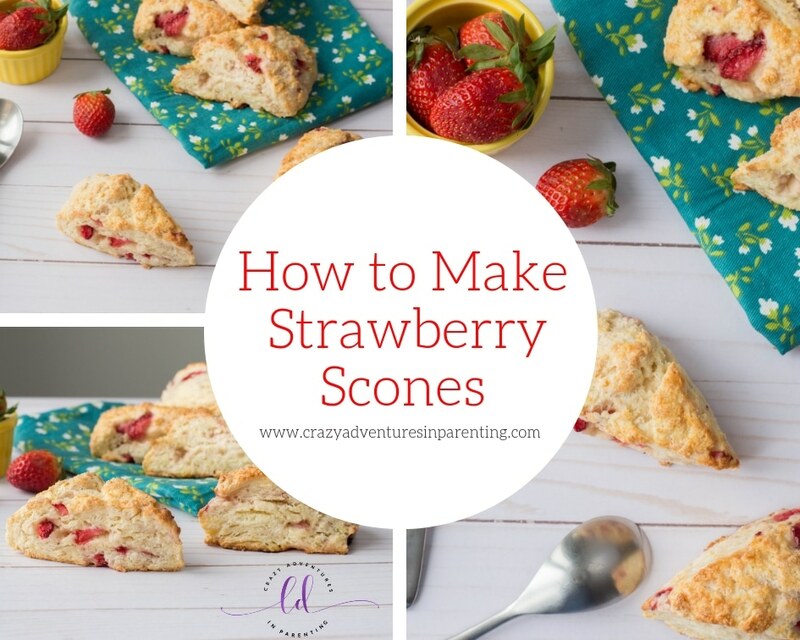 I do prefer to make a ton of things from scratch, like this Strawberry Scones recipe, but even when it is made from scratch, I aim to make it as easy as possible to create and duplicate. This recipe will make eight delicious Strawberry Scones, but you could easily double or triple for a larger crowd, get together, or batch cook for future breakfasts. To make this Strawberry Scones recipe a huge success, you have have the right tools. It’s absolutely important to have a good sifter to sift your dry ingredients to prevent any chunks of flour, sugar, or other dry ingredients. Using a good quality serrated knife to cut the scones into their shapes is also important, too. Go ahead and make these for a special breakfast for a loved one. Valentine’s breakfast, anniversary breakfast, maybe even a birthday breakfast! For me, though, because of my hearty love of scones, I make these on the weekends. A little something-something to help celebrate the weekend, you know? Line a baking sheet with parchment paper (or reusable silicone baking mat) and set aside. Preheat oven to 400 degrees F. Ready all your ingredients needed to make these Strawberry Scones. In a small bowl, pour granulated sugar over strawberries and mix until completely coated. As you’re doing this, do your best NOT to sing “Pour Some Sugar On Me” by Def Leppard (because I do this EVERY FREAKING TIME, OMG). Set your strawberries aside to get all nice and juicy. In a medium-sized bowl, sift together dry ingredients: flour, baking powder, and salt. Add sliced butter pieces into the bowl of dry ingredients. Cut the butter into the dry ingredients with a pastry cutter until they are well-combined. In a large bowl, whisk together the egg and the milk. Add the dry ingredients into the large bowl of wet ingredients. Start mixing altogether with a wooden spoon. Add your sugared strawberries into the batter and mix the ingredients fully. Once dough starts to form well where everything is mixed together, pour onto a clean working surface. Knead the dough until smooth and then place it onto your lined baking sheet, forming it into a circle (about 8 inches in diameter). Use a good quality serrated knife to cut the dough into eighths, just like pie pieces. Separate each dough piece on the baking sheet. In a small bowl, whisk the egg and use a basting brush to brush the egg on top of each scone. Top your egg brushed scones with sprinkled granulated sugar. Bake in the oven for 15 to 20 minutes or until top is golden brown. Allow to cool slightly on a wire rack. Serve and enjoy. Line a baking sheet with parchment paper (or you can use a reusable silicone baking mat) and set aside. Preheat the oven to 400 degrees F.
In a small bowl, pour granulated sugar over strawberries and mix until completely coated. Set aside to let the strawberries get juicy. In a medium-sized bowl, sift together dry ingredients using a sifter: flour, baking powder and salt. Add butter pieces into bowl of dry ingredients. Cut with a pastry cutter until all ingredients are well-combined. In a large bowl, whisk together egg and milk. Add dry ingredients into large bowl of wet ingredients. Start mixing with a wooden spoon. Add the juicy strawberries into the batter and continue mixing some more. Once the dough starts to form, pour onto a clean working surface. Knead it until smooth and then place it onto lined baking sheet, forming it into a circle (about 8 inches in diameter). Use a good quality serrated knife to cut the dough into eighths, like pie pieces. Separate each dough piece so that they’re equidistant apart from one another. In a small bowl, whisk egg in a bowl. Brush egg with a pastry brush on top of each scone using a pastry brush. Top off with sprinkled granulated sugar. Bake for 15 to 20 minutes or until top is golden. Allow to cool slightly on a wire rack.